Dostoyevsky's epic masterpiece, unabridged, with an afterword by Robin Feuer Miller One of the world's greatest novels, Crime and Punishment is the story of a murder and its consequences--an unparalleled tale of suspense set in the midst of nineteenth-century Russia's troubled transition to the modern age. In the slums of czarist St. Petersburg lives young Raskolnikov, a sensitive, intellectual student. The poverty he has always known drives him to believe that he is exempt from moral law. But when he puts this belief to the test, he suffers unbearably. 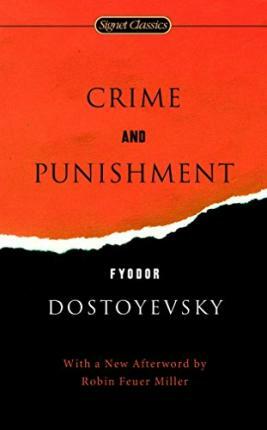 Crime and punishment, the novel reminds us, grow from the same seed. "No other novelist," wrote Irving Howe of Dostoyevsky, "has dramatized so powerfully the values and dangers, the uses and corruptions of systematized thought." And Friedrich Nietzsche called him "the only psychologist I have anything to learn from." With an Introduction by Leonard J. Stanton and James D. Hardy Jr.
Fyodor Dostoyevsky (1821-81) was educated in Moscow and at the School of Military Engineers in St. Petersburg, where he spent four years. In 1846, he wrote his first novel, Poor Folk; it was an immediate critical and popular success. This was followed by short stories and the novel The Double. While at work on Netochka Nezvanova, the twenty-seven-year-old author was arrested for belonging to a young socialist group. He was tried and condemned to death, but at the last moment his sentence was commuted to prison in Siberia. He spent four years in the penal settlement as Omsk. In 1859, he was granted full amnesty and allowed to return to St. Petersburg. In the fourteen years before his death, Dostoyevsky produced his greatest works, including Crime and Punishment, The Idiot, The Possessed, and The Brothers Karamazov. The last was published a year before his death. Leonard J. Stanton is Associate Professor of Russian and James D. Hardy Jr. is Professor of History and Associate Dean of the Honors College at the Louisiana State University. Robin Feuer Miller has written on Dostoyevsky, Dickens, Rousseau, Tolstoy, Chekhov, William James, and the nineteenth-century novel. Her books on Dostoyevsky include Dostoyevsky and The Idiot: Author, Narrator, and Reader and The Brothers Karamazov: Worlds of the Novel. She is Edytha Macy Gross Professor of Humanities at Brandeis University, where she teaches Russian and Comparative Literature.